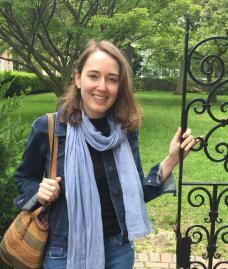 Michaela Haffner studies nineteenth-century French art and visual culture, with particular interest in the intersection of science, medicine, and the decorative mode in fin-de-siècle art. She received her B.A. in History of Art and French from Wellesley College, where she was awarded the Plogsterth Senior Prize in Art History for her honors thesis “Édouard Vuillard: Painting Disease and Infirmity in Fin-de-Siècle Paris.” Prior to joining the doctoral program at Yale, she held curatorial positions at the Musée du Louvre, The Museum of Modern Art, and the Davis Museum and Cultural Center. Most recently, she worked as a curatorial assistant at the Amon Carter Museum of American Art (2015-2018) where she curated exhibitions including Fluid Expressions: the Prints of Helen Frankenthaler and Hedda Sterne: Printed Variations.